The race went really well for me. Too well for my wife. Going into it the deal was one and done. Might not be that easy now. . . I drove over to PCB the Wednesday before. NASTY wet weather when I arrived, but the forecast for Saturday said clear and sunny (but cool). On Thursday I waited in a super long line to check in and chatted with the fellow in front of me. He has done IMFL 10x, so he had plenty of tips for me. Later that afternoon I drove the bike course with my parents who came over early with me. Miles 50-60 were an out and back on a road full of cracks. Driving along at 60 was bumpy, I was dreading riding the section on a bike at a considerably slower speed. On Friday I dropped off my bike and transition bags. Did a little work, but for the most part took it easy and relaxed. My wife and girls arrived later that afternoon, as well as my HS buddy Pete Sinelli and his family. Karen arrived with goodies. First was my custom race logo t-shirt for the support crew. Second was my favorite fish tacos from a restaurant in downtown Jacksonville. Eating at the Burrito Gallery every Friday night pretty much became a tradition before the epic Saturday work-outs, so I wasn't messing around with the routine. Race day started at 0300 with a breakfast of Nutella on bread with Gatorade. Went back to bed and woke up at 0440. Pete dropped Karen and me off near transition around 0515. It was cold! Temps were in the high 30s. I dropped off my special needs bags and was body marked by Gabriel Martinez, a friend from Jacksonville who was volunteering so he could register for next year. A quick check of my bike set-up and I was ready to get inside. Quick trip to the bathroom and then Karen and I just relaxed in the lobby for a while with a couple hundred other nervous athletes. I applied Body Glide to my neck and shoulders and put on some sunscreen, and then slipped into the wetsuit. The crowd starts moving outside around 0630. On the beach, I am freezing! I wore socks that I could toss and Karen brought a blanket for me to wrap up in. About 5 minutes before the race start, I walk over to the water's edge and line up to the right of the buoys since the current is running east. A little nervous chatter with some folks, but I'm really not super nervous. BOOM! Into the water, walk across a sand bar, and start swimming. An Ironman start is pretty crazy. Unbelievably, I would occasionally find myself in open water but it wouldn't last long. I was kicked, scratched and folks tried to swim up my back. I was kicked once in the groin, and one time when looking up to sight the person in front of me unloaded a powerful kick that almost connected with my nose. I have no doubt it would have broken it. Traffic around the first turn buoy was insane. It looked like a scene from Titanic. Folks were in a very jovial mood as we bobbed in the water waiting for an opening to start swimming again. Shouts of "Woo-hoo! Ironman Florida!" and the like were common. Really felt like I was moving once I made the first turn and on my way to the second turn. Swimming to the shore was pretty snappy as well. Then we had to get out, run up an embankment on the beach where the tide had created a cliff, and across a mat before going out for a second loop. I felt like I was in a herd of cattle on the beach. Took a gel that I had stored in the sleeve of my wetsuit and some water and off for the second loop. Much more room on the second loop, but I could feel a bit of fatigue when swimming parallel to the shore, and then swimming back to shore was the worst. The water was becoming VERY cold. The water temp at the start was 74, but I think all of the churning from the swimmers cycled some of the colder water below up to the surface. I was losing feeling in my arms (Love the sleeveless wetsuit. Hate the sleeveless wetsuit.). Once on shore, I was relieved that was over and ran to T1. Unfortunately, after they peel your wetsuit (in an incredibly cramped area and on sand), you run through a fresh water shower. I was shivering and got through the shower as quickly as possible. I picked up my bag and ran to the changing tent inside the hotel. It was completely full so I ducked into an adjoining ballroom where a bunch of other guys had also found some space. The downside was no volunteers to help. I really needed one because I couldn't feel my arms, and I had a terrible time trying to get my arm warmers on. And then trying to keep the HR monitor secured around my constricted chest. And pulling my cycling shorts up. Once changed, I ran out and ducked into the portalet. T1 was an absolute disaster! 17 minutes. At the mount line, folks were busting left and right trying to clip in. I dodged the carnage and was ready to ride. The ride seemed to go by very quickly. There were a few packs on the first long section of the ride heading north and I played leap from with a few guys riding at about the same speed. A little headwind, but nothing terrible. I ate my Clif Bar (240 calories). We turned right in the might metropolis of Ebro to go east and caught a bit of a tailwind. Eleven miles later it was another right turn to head south. Through this section I was flying! Had it in the biggest gear and was just spinning. 24 mph for the 7 mile stretch and the HR was pegged at 138. I took my first gel at this point (2 hours elapsed). We turned left to head east again for a 10 mile stretch before the bumpy section. About halfway through this portion I came up on a cyclist laying in the middle of the road with his bike on the grass. A volunteer was directing folks around him. He wasn't moving and didn't look good. A few miles up the road, an ambulance passed going in the other direction. Not sure what happened, but his day was over. Was interesting riding the bumpy out and pack and have a chance to see was in front of me. A couple of times I was tempted to ride on the grassy shoulder and avoid the bone jarring surface of this road. We did a 180 and assembled a small pack as a result of the turnaround just in time to pass the penalty tent 50 yards later. We quickly dispersed and picked up special needs bags. I tossed my empty bottle which had contained Hammer Perpetuem (675 calories for the first 2.5 hours) and got my second bottle of Perpetuem. I also had some chocolate chip cookies, Snickers bites and gels in the bag. We turned right off of the bumpy road on to a 3-maile stretch of pristine blacktop. There was a huge drop followed by a hard left turn. I'm glad I drove the course the day before if nothing more than to know this was coming. The next 20 miles SUCKED. Rolly hills that weren't terribly steep and gave me a chance to get out of the saddle, but the headwind was miserable. I looked down a few times to see 16 or 17 mph. During this part of the ride I ate half of a cookie and immediately my stomach was not happy. Nothing terrible, but I knew I wouldn't be doing that again. Near the end of this stretch I had to stop at a station to pee. No room in the portalets, so guys were irrigating the pine forest behind the station. I felt much better after relieving myself and a quick left to head south towards the end of the bike helped. What helped the most was another terrific tailwind. There was a little dogleg out and back that lowered the average for this 21 mile stretch a little, but I still averaged 21.5 all the way home. About a mile before T2, I slipped my feet out of my shoes to let my feet get some air and stretch. The fellow I stood behind in line at check-in recommended this and I'm glad I did. It also allowed me to hop off the bike quickly and just run in sock feet vs. the bike shoes. T2 was less crowded than my T1 experience and I plopped down in a chair and was quickly supported by a volunteer. I chose not to change out of the cycling shorts (Desoto 400-mile shorts, so worth the money!). I had packed my RaceReady running shorts with gels, but decided the compression in the Desoto shorts would help on the run. The pad in the Desotos is not uncomfortable at all on the run and the shorts have built in pockets on the leg and one on the back to store gels, endurolytes, and snickers. I wish I hadn't pre-packed the running shorts with the gels. A quick pit stop on the way out of T2 and I was feeling great. As I reflect, I never really felt bad on the run. The first mile was exhilarating. Tons of support including a bunch of friends from Jacksonville. But what I was really looking forward to was seeing my family just past the one mile marker. Unbeknownst to me, the section right before our beach house is an annual tradition where a group of ladies "dress" to motivate. Besides the costumes, they incorporate whips, Christmas lights and a disco ball into their "aid" station. w00t! I didn't pay a great deal of attention to them however (honestly), because I could see my family. I've been racing for over 7 hours and this is my first real chance to see them. AMAZING. High fives plus hugs and kisses for everyone! The next mile was a blur and around mile 3 I realize I've gone an hour without a gel. I walk through the next aid station to take a water, endurolytes and a gel. On this first loop I would walk briefly through the aid stations to get fluids. The first several aid stations were entertaining. A medieval theme followed by a circus theme certainly lifted the spirits of the participants. Again, I can't remember feeling like I was struggling at any part of the run. I remember intentionally slowing down to keep the heart rate in check, but never because I was hurting. On the first loop through the state park there was a lady lying in the middle of the road, her sunglasses broken and her face bleeding. Not sure what happened, but I could see support vehicles in the distance rushing towards us. A volunteer was with her, but it was depressing to think her day was over with just under 20 miles left to run. As we headed back towards the finish line, we picked up a slight headwind. Again, the miles flew by and I was back at the beach house to see my family again. More high fives, fist pumping and another kiss for Karen. I would see them again in about 20 minutes as I began my second loop. At the halfway point I picked up my special needs bag. Why did I pack all of this stuff? Socks, a long sleeve shirt, a jacket and gloves. I tied the jacket and shirt around my waist and stuffed the socks up my shorts leg. When I got back to the family I left the jacket and socks and continued with the long sleeve shirt. Once I was in the park again the sun was setting and I decided to take a brisk walk and put the long sleeve shirt on. At this point I was going to comfortably beat my goal. One quick stop at a portalet at the 20 mile mark and I was cruising towards the finish line. No more stopping at aid stations, I was just grabbing coke to go with my Snickers bites. Nirvana! At the 23 mile mark I was given a glow stick. Many people had discarded their sticks, but I felt like it gave me power. No shame in running with the glow stick when you are about to be an Ironman. When I reached the beach house for the last time, it was just me and "the naughty girls". My family had already gone to the finish line. There was an incredibly dark section in the last mile but then we pop out on the main drag to neon lights and a view of the finish line. Those last 200 yards? Indescribable. I still get goose bumps thinking about them. I'm going to be an Ironman! I was so caught up in thought I forgot to look up and say cheese as I crossed the line. Somehow, both arms instinctively went up in the air to show everyone I broke 12 hours. Strange how the mind works. After crossing, I was met by a volunteer from Charlotte, NC who came to register for next year's race, his first Ironman. He grabbed a blanket for me, then took me to get my prizes: a medal and a hat. We chatted about the race as we waited for my turn to get a finisher photo. I told him what a great time he's going to have. We said good bye so he could go catch another Ironman. My next stop was the food tent. Solid food! A piece of pizza and a coke. I was then focused on finding my family in this dark mass of humans. Fortunately, they found me. I have to admit, the reunion with Karen was emotional. We did this race together. I couldn't have done it without a tremendous amount of support, patience and understanding from her. Then, hugs, kisses and high fives with the rest of the crew. Emily, Maggie, Mom, Dad, Pete, Amy, Mike and Alex. Later that night, Pete and Mom went to get my reward treat. A sackful of Krystals. Mmmm. Unfortunately, my throat was raw (from breathing through my mouth?) and I could only eat 2. Still so delicious! We all sat around and talked about the race until about 11. I wanted to go to the finish line to see those finishing before the midnight cut-off, but I would have been alone. At that point everyone had gone to bed, except me. I went out to the street and watched some of the last runners come through with my friend, the "naughty nun". Many people told me this would be one of the greatest days of my life. They were right. Five months ago I was a broken man. Well, at least I was a man with a broken elbow. On January 18th, I broke my elbow on my last hard training run before starting a taper to prepare for the Tallahassee Marathon. The month before, I had run a solid Jacksonville Marathon, but the warm weather prevented me from doing as well as I wanted. I took a week off and then started the long runs again to carry my fitness to the Tallahassee race on February 1. I was feeling really good and knew the weather for that race was always conducive to a fast time. But instead of racing, I was sidelined with a bum wing. Actually, my doctor told me I could run the race but if I fell again it would mean surgery. I did as I was told and took it easy for 4 weeks, gingerly running to maintain my fitness and trying not to fall down. Four weeks later, although I still wasn't in the "clear", I led a pace group in the Breast Cancer Marathon. Helping others achieve their goals was rewarding, but at the same time I was demoralized knowing that I had built up a terrific base and hadn't quite capitalized on it. More than anything, I would love to break 20 and get a pie at the Run for the Pies! My PR is 20:53. Can we knock off a minute in 3 months? For sure let me work on it and I'll get back to you. Just send me roughly what a typical week is like for you so I have something to go on! Over the next 12 weeks, I trained as hard or harder than I have trained for marathons and half-ironmans. Long runs of 15 miles, hot track work-outs with long fast intervals, tempo runs and rides, and bike-run bricks. Plus there was the 0500 tempo run in the May monsoon through ankle deep water in San Marco with Paul and Jason where I ran a 3-mile stretch as fast as I have ever run in normal conditions. Breaking my elbow and not being able to train certainly helped me sharpen my focus and intensified my drive to aim for a goal that has eluded me for some time. My last 5k PR was a 20:53 in January 2003 at Matanzas in St. Augustine. That race features a fast course and that day was perfect for racing, in the mid-50s. I was still pessimistic that I could drop a minute off of that time in a hot, humid race. The first test actually came in late April. I ran the Fleming Island Rotary in 20:19. A little over 6 weeks into the program and 34 seconds shaved off of my PR. Coach Paul was helping me break through some mental barriers as well as physical barriers. I accused him of Jedi mind tricks because I was running splits on the track that I would have never imagined. Then 4 weeks later, on a hot, humid morning, 4 days after the monsoon run, I ran another 20:19 in the Memorial Day run. Running that race so well after tough training gave me confidence that I would be able to break 20 after some rest, but the lingering doubts still clouded my mind. The Run for the Pies started out catastrophically for me. I lined up for the race in the third row and was nervous but ready, engaging in the usual pre-race banter with the folks around me. Then the cannon went off and the mad rush was on. No more than three steps into the race, some yahoo muscles his way through the crowd and hits my arm so hard he knocked my Garmin off of the wrist strap. I have the quick release strap for transition in triathlons between the bike and the run. I have never had the unit knocked off the strap before, and now it is under hundreds of feet getting kicked around and bouncing like a pinball. Unbelievably, I was able to locate it and reach down and grab it 50 feet from where it was dislodged. I was pushed and shoved as I went down to get it, and atthis point in a complete panic. The fall had caused it to turn off, and instead of turning it on, or even re-attaching it, I ran with it in my right hand. It's a good thing I didn't see my heart rate at that point. So, up the incline of Hogan Street and a left onto Duval. Just under a half mile into the race, Paul McRae starting running with me. He didn't ask me any questions, just gave me instructions and let meknow I was on pace. After the turn on to Duval, there is a downhill stretch. At the end of the stretch there is a left turn and you reach the first mile marker. Six minutes? Holy cow! Paul told me to stay with him, but I knew I wasn't going to maintain that pace. He told me we made up some time going down Duval and needed to bank some for climbing it on the way back. We ran down Adams Street and I starte dto develop a terrible stitch in my right side. I was working hard and had no idea how fast I was going. I had a feeling I was slowing down. After a quick 180 degree turn we started doubling back on the course and hit the 2 mile mark. 12:36. My pace had dropped like a rock, but I was still 16 seconds ahead of where I needed to be. The last mile Paul yelled "Come on Marshall" about a bajillion times, and every time it reminded me of how far I had come and I was able to do this. Back up the incline on Duval, Paul implored me to catch him. I surged up the hill and pulled in behind him. From that point on, it would be flat and downhill. On Hogan Street, Paul told me to pick it up, "Now or never!" I heard some friends yell my name and I knew I was 2 minutes from the goal. Heck, I can do anything for 2 minutes. I hit the 3 mile mark in 19:11. The third mile was much like the second, a 6:35. I had 48 seconds to run a tenth. Quick math told me that was an 8:00/mile. I knew I had the goal, but I wanted to come in well under. I saw Karen and the girls and my parents just before the finish. I was giving everything i had. The final split was 38 seconds for a 19:49. So, from a broken elbow three months ago to breaking a 3 year old PR. What a great journey! I appreciate my family for putting up with the crazy training. Early mornings and a few late nights (including leaving for a 12-mile run on Easter Sunday evening at 8:30 after Easter egg hunts, lunch with the entire family, and an afternoon at Disney on Ice). I appreciate my terrific friends for their words of encouragement, and sometimes for politely asking about my sanity. Finally, late Saturday night, Karen asked me what's next. UPDATE: If you are interested in breaking down some barriers of your own, I would recommend you contact Paul McRae about your goals. His rates are reasonable and he is a terrific coach. If you want to train with a group, Coach Paul has partnered with the Jacksonville Running Company to offer a training program for folks of all ages and abilities. This project has taken FOREVER. End of year school activities, a trip to the west coast and life in general has prevented us from completing the project. However, we can see the light at the end of the tunnel. The room is now painted, the door to nowhere has been closed up, the ceiling fan has been installed, and the carpet is now being put down. Still waiting on the new windows to be installed, but looks like we will be able to start moving furniture in this weekend. 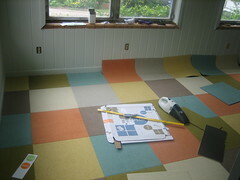 Thanks to the Content Design Group guys for coming by this week to help me get started laying the carpet tiles. Also, thanks to Nunu for helping with the fan and extra special thanks to Karen for all the work she has put into the project painting walls and trim and scraping door panes. The folks at the Carolina Godiva Track Club created a terrific race format called the "Donut Run" for their Winter Race Series. Kind of last minute, but would anyone be interested in doing a tweet up version of this tonight to celebrate National Doughnut Day? LAP 1 Team of 3 must stay together. All run as fast as your slow runner. LAP 2 Same as lap 1. LAP 3 Shed 1 runner. The shed runner will run lap 5 alone. The remaining 2 runners must stay together. LAP 4 Shed 1 runner. He/she is done, has completed 3 circuits. The remaining runner pops off his/her best alone. After this lap, 4 completed for that specific individual, done. LAP 5 The runner shed after lap 2 now has a crack at lap 5 alone, after hand touch. Team time is then divided by cumulative age, called Donut Index, and rankings are made for event placing. If interested, sent me a tweet @metamarshall or leave a comment on this post. If we can't pull it off tonight, maybe tomorrow evening? Donut Run followed by the Run for the Pies the following weekend. SWEET! Not sure I want to know EXACTLY how bad my swim stroke is. . . Using the same sensor technology found in Apple's iPhone and Nintendo's Wii controller, SwimSense is building the first performance monitor for swimmers. As we checked out of IKEA, I was wondering how on earth we were going to be able to get three shopping carts of flat cardboard boxes into the back of the truck. Somehow, we managed to get everything loaded and not blow out the tires driving back to Jacksonville. 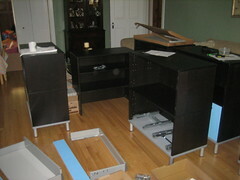 Karen and I spent much of Saturday night assembling the units. Once we figured out the basics, things actually progressed fairly quickly. We are now 90% done, I just need to install the roll fronts for the cabinets. These are kind of a pain because many of the holes are not pre-drilled. The other area of concern is adding the pull handles, since the holes for those are not pre-drilled either. However, Greg from Content Design Group came to my rescue and said he would build a jig for me to make it easier. Go Greg! Karen picked up the "Healing Aloe" paint from Benjamin Moore for the walls and "Black Bean" for the built in shelves and doors to match the cabinets. Next is ordering the carpet tiles and packing up the office. I'll also be putting some of the old book cases, hutches and filing cabinets on Craigs List in case anyone is interested in some cheap furniture. Plus I have a great old CRT to sell you! This is the first installment in a series chronicling the progress of the MMB Office Project, or MMBOP. Greg Beere and Jason Fisher at Content Design Group recently helped me redesign my home office. Really neat design with lots of options for storage. Plus they told me I had to get rid of the old 16" CRT, which I replaced with a nice big flat screen monitor. Read their write-up and view the renderings, really cool stuff. We have received the carpet samples from FLOR and picked out a pattern we like, a little different from the one in the initial design. 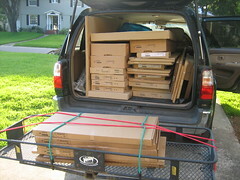 So tomorrow is the trip to IKEA to pick up the furniture, or at least as much as I can get into my truck. I've never been to an IKEA before, but I hear I have to get the Swedish meatballs. My office is still as messy as in the Content DG post (actually, I think it may be worse). The other goal for the weekend is to start pitching the junk and organizing what is left. No easy task. I'll update the blog with photos as the project progresses. I'm too embarrassed to post pictures of it's current state. Thanks again to the guys at Content Design Group for helping me with this project. I've learned that if you are going to invest the money into a project like this, you need to get help from people who know what they are doing! My running has improved significantly the last several months thanks to the guidance of Coach Paul McRae of Personal Running Solutions. I joke with my friends that he is using Jedi mind tricks, but he really is doing an effective job pushing me to run better. And it isn't just a matter of making me run more, instead he is reviewing my progress and giving me work-outs that will help me achieve my goals. Today, the plan was a 2-mile time trial at the Metamile since I had to miss last nights 5k. I ran a little over a mile to warm up. Coal Paul asked me what I thought I could do and I responded that I would be happy with 13:00. He told me he had 12:30 in mind. The lump in my throat soon became a sinking feeling of dread in my stomach. We did a few strides and then we were off. After taking a quick glance at my watch at the first mile split and seeing 6:11, I really thought I was going to die before I completed the second Metamile. He pushed me hard the second mile, literally a couple of times, and I ended up finishing in 12:30. It was painful, but it was good training to run hard while feeling tired. If you are looking for someone to push you to achieve your personal goals, I highly recommend Coach Paul McRae. Very proud of Emily and Maggie for doing a terrific job in last night's talent show at school. It's funny to see how fearless girls are in particular. I would say 80% of the show performers were girls. Of that 80% were singing or dancing to Taylor Swift or Miley Cyrus. Good times. Team Liver Families enjoyed yet another successful Katie Ride for Life (http://www.tinyurl.com/katieride) today. The organizers enjoyed their biggest event ever for a terrific cause. If your not already, make sure to register to be an organ donor. After the ride, I returned back to the Plantation resort where Karen had just wrapped up a trip to the spa for a manicure and pedicure. The rest of the afternoon has been spent relaxing and hanging out at the pool. We are headed into Fernandina for dinner at 29 South, where I first had the Krispy Kreme bread pudding. Yum! 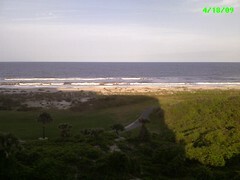 Tomorrow is an 8 mile run on the beach and trails and then head home.